The Parable of the Prodigal son is more than a story of forgiveness granted by a gracious father it is a story of families and the need for family reconciliation. Further, the story goes even beyond a father and his two sons. The story tells of the need for acceptance, for tolerance, and finally for magnanimity. The father pulls his son close to him. Tears begin to fall from the elder son’s eyes—he feels defeated. Arguing will lead to no avail. Nevertheless, the son is not ready to concede the father’s right to bathe his prodigal son in such joy and largesse. The older son finally sees the point, grudgingly reconciles, and then joins the celebration. Both sons now forgiven and are now the father’s joy. That is one way I look at the story of the Prodigal Son. There is another interpretation I think is also worthy of examination. While some do not wish to acknowledge this fact, we must remember Jesus was not apolitical. That is, Jesus, aware of the politics of the time. Specifically, Jesus knew that a great division had developed between the Jews of Israel and those Jews in diaspora—most especially between those who were greatly influenced by Greek culture in Alexandria. Further, within the Jewish culture in Palestine of the first century, those who wished to maintain a purified abhorred any contact with the non-Jewish world. Those purists wanted to remain isolated from the world. Division and isolation may be behind the story of the Prodigal Son. The story reminds all parties that they are lost and in need of finding. Both those who believe they are descendants of Abraham, by the first century. have wandered away from God and dissipated their heritage. In the story, Jesus tells the people of diaspora that they are welcome in the family of the Abrahamic descendants who have remained true to the ancient faith. He reminds those who believe that they are entitled to special consideration, God takes people as they are. There is no special status for the stay-at-home Jews on the grounds that they are the true descendants of Abraham. His cousin, John-the-Baptist denounced any claim to special status when he said, “Do not presume to say to yourselves, ‘We have Abraham as our ancestor’; for I tell you, God is able from these stones to raise up children to Abraham.” Nevertheless, God, as the father in the parable, wants all the faithful to return to its foundational roots. Those foundational roots are not so much found in the law of Moses, which by this time is expanded beyond the Torah to over six-hundred prohibitions, as they are found in the beneficent acts of God. If God is beneficent, then the faithful must be beneficent and willing to reconcile and engage the world. The basic issue, then, is that the people of first century Israel are so bound by their misapplication of the law and demand for ethnic and racial purity that they no longer remember the love God has shown to them. They have, in other words, dissipated the gift of love given to them in the Exodus—the release from slavery and death. They have in their own blindness been enslaved by the prejudice and a belief in their own exceptional and unique status. The law was intended to teach two basic principles—love God and love your neighbor. The law for the descendants of Abraham, by the first century, had become a means of assuring a privilege and separation. Thus, the only neighbors recognized as worthy of love were people like themselves. In the parable of the Prodigal Son Jesus teaches that God, who Jesus calls Father, seeks all who worship, whether in Jerusalem or elsewhere, to repent—that is, rethink—of the dissipation resulting from separation from the faithful, isolation as a means of remaining pure, and boasting of being steadfast in the law. When all are reconciled with God, the angels of heaven rejoice. All that may seem remote to us today in the twenty-first century. I argue, however, if we as a people today do not rethink our misuse of the gifts of Providence, we will remain in the purgatory of squandered wealth and health. If we do rethink our place on the planet, the earth and the entire universe will rejoice. If we do not seek to return to the basic truths of life—love God and love neighbor—we are the prodigals. Even that, however, may seem remote and untenable to some. Because of our own pride and self-centeredness, let us place the Prodigal Son story on a personal level. Instead of thinking of ourselves as the prodigal, let us think of ourselves as first, the father in the story, and then, secondly, as the older son. 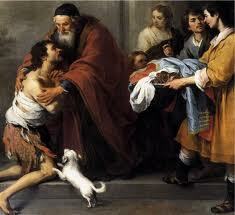 The prodigal’s father allowed his younger son to have his way. The younger son wants his freedom, he wants to cut his ties to the family, and he wants to experience life—sounds familiar in so many ways. The father, who loves his younger son, instead of attempting to control outcomes, allows the son to have his way. Not only does he allow the boy to go, he gives him his blessing in the form of the boy’s share of his inheritance. Letting children go to do “their own thing” is difficult but sooner or later must be done. Often children make wrong choices and we parents despair. We want to jump into the fray, save the child from his or her mistakes, and make everything come out right. Even in the grimmest of situations and conditions, such rescue does not work. It is not until the child comes to her or his self is change possible. After years of working with families in the priestly ministry and as a mental health therapist, I have found it difficult to watch families break up in anger with no hope of reconciliation. Such families are heartbreaking. Some in the family seek to heal and others are so angry they will never reconcile; that is, find a way to overcome the hurt feelings and pride. I have seen such anger displayed in families as parents or children cannot forgive. At funerals, for example, when it is too late to reconcile the unrelenting anger does not subside. Anger overcomes grief, jealousies overcome love, and blindness to the humanity of the other prevents reconciliation. The father in the Prodigal Son story is not willing to stay in an unsettled state of dysfunction–he never surrenders to despair for his sons. The Parable of the Prodigal Son is an appeal to us to turn away from ego and an unwillingness to forgive. Possibly, it is easier to be the forgiving parent. Siblings have a different relationship. Each wants the attention of parent—sometimes in equal measure and sometimes more attention than the brother or sister. Siblings are accidents to each other. They did not create their sisters or brothers and in some instances did not even wish to share space and time with an equal in the family hierarchy. Regardless of birth order, sibling-hood often is a difficult relationship. We can hear the strain in the older brother’s complaint. He did everything correctly and well. Why should he have to ignore his brother’s bad choices? Would you, if you were in his place? Not only has his brother used up the father’s resources, now he is back taking up even more. Angry may not be an adequate word to describe the older brother—livid, irate, enraged may be more descriptive. Again unrelenting pain arising from unrelenting anger only leads to more pain, more anger, and more outrage. The father wants his older son to know he too is loved. Nevertheless, the father wants his older son to see life reborn, resurrected, from repentance. Because he did all the right things, the older son does not have special privilege; he has the privilege of inheritance, of being the son of a loving father. Further, the older son only has done what is expected of a responsible child. Merely being descendants of Abraham does not set the homebound Jews apart from diaspora and visa-versa, and being Jewish does not set the faithful apart from the impure world, the older son’s claim to advanced status in the family does not give him special advantage. There is no claim to God’s favor without willingness to rethink, to reconsider, to positively change, and return to the family circle of God. We come to the Father as individuals in need of repentance, of rethinking. Everyone needs to rethink—that is, repent—to experience the calmness that comes through reconciliation. We are all prodigals. All nations are prodigal, all bands of humans are prodigal, and all are in need of repentance, of rethinking priorities, and seeking both forgiveness and to forgive. Matthew 3:9. A repeat of this warning appears in the Gospel according to Luke, chapter 3, verse 8.